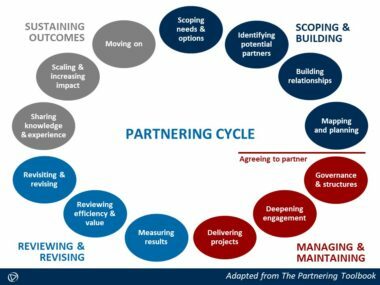 at different times during the partnering cycle (see the schematic below that seeks to capture the life cycle of a partnership in manner that is similar to/ parallel with a typical project cycle). It is unlikely that any one person will be able to perform all roles equally well, so a key task for a partnership broker is to know when to identify someone else to step up/ step in to the brokering role for a specific purpose. In the light of this, it may be more helpful to think about brokering as an activity shared by several rather than a single broker. In any event, it is a key brokering task to help build the confidence and capabilities of partners and/or others to take on intermediating/ brokering roles. On the one hand, partnership brokering requires ‘art’ in the sense of people skills, imagination, intuition and active listening and on the other hand it requires ‘science’ in the sense of administrative skills, knowledge, rigour and precise speaking. Confidence to hold space To help partners work through complexities, intractable issues and ambiguities that have no immediate or defined answers. Negotiation To work through differences of opinions and values in a way that explores underlying interests and help partners develop empathy and understanding for each other’s perspectives. Facilitation To promote relationship building on principles of equity, transparency, mutual benefit and embracing diversities. Difficult conversations are key to partnership building. Measured and skilled confrontation may also be required. To manage and record complex data and layers of information and experience. Synthesizing discussions in partnerships entails developing a frame of reference that is consistent with that of the partners. Articulation and Presentation To communicate with precision and represent the nuances of a discussion or an issue. 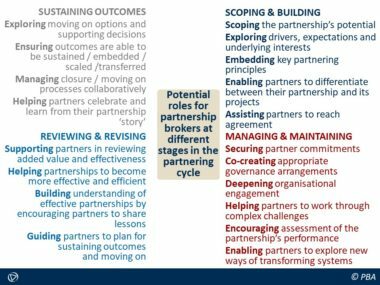 Partnership brokers have to understand and articulate the frames of reference used by the partners. To build a brokering team and role model co-working, shared responsibility and collaborative decision-making. Ultimately, as a partnership progresses, the broker will transfer responsibilities to partners (or project staff). This involves stepping back from a front line role and working in the background to support and coach individual partners or staff in building their own partnering and partnership brokering skills. To help increase the engagement of partner organisations as well as helping each organisation become more ‘fit for purpose’ in their partnering approach. Brokers will also need to help partners build governance and accountability procedures as the partnership itself becomes more ‘institutionalised’. Partnerships benefit from regular reviews to ensure that they remain animated and do not lose momentum. As someone with close knowledge of the partnership, the partnership broker is uniquely placed to facilitate reviews themselves or, if they are seen as too close to the partnership to do this objectively enough, to brief someone else to facilitate the review on behalf of the partners. They may also have a critical role in helping the partners to revise the partnership based on experience. Download: Partnership Brokering Roles and Tasks. 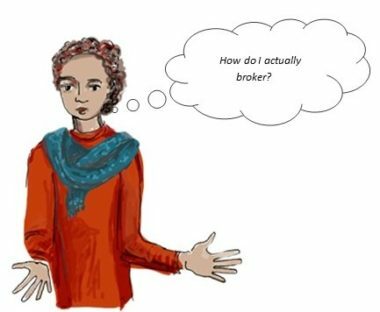 Download: Being a Partnership Broker: Tools for Self Assessment & Reflection. For vocational training and professional development go to: Training. For partnership brokering assistance from professional/ authorised partnership brokers go to: Supporting.